There was a time that the guitar-slinging blues singer was the epitome of cool in the music world. From Robert Johnson to B.B. King to Stevie Ray Vaughan, the blues guitarist set the standard by which other musicians measured themselves. The rise of grunge in the early '90s got rock musicians to more or less abandon the solo, and even in the blues, the guitarist has had to share the stage with keyboards, horns and pure singers over the past decade and a half. But Michael Burks apparently missed the memo on these changes in the music. An old-school Chicago-style electric blues guitarist, playing his Flying V with style, swagger and not a little virtuosity, Burks tears through an even dozen songs on his new CD, his third on Alligator Records. Where many of the young bucks coming up in the blues now seem almost embarrassed by their ability to wring notes out of their guitar, instead opting for a jazz-like emphasis on chord changes rather than the barbed-wire approach of an Albert Collins or Son Seals, Burks instead seems to be channeling the spirit of those two legends into his linear playing. 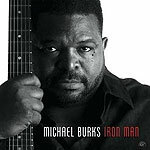 A solid singer, with a deep, resonant voice, Burks' new album is nevertheless focused on his guitar playing  on solos that jab and slice, with an in-your-face approach to playing electric guitar that is refreshing in its forthright assertiveness.